“100 Questions & Answers about Esophageal Cancer” was published by Jones and Bartlett and authored by Dr. Manjit Bains, Bart Frazzitta and Nurses Pam Ginex and Jackie Hanson. We have just completed a revised edition of this book and Nurse Jingeleski has replaced retired Nurse Hanson as an author.This book can be purchased at any book store. Whether you’re a newly diagnosed esophageal cancer patient, a survivor, or a friend or relative of either, this book offers help. 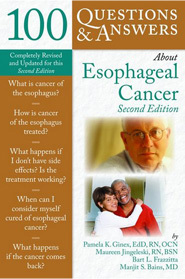 The only text to provide the doctor’s and patient’s views, 100 Questions & Answers About Esophageal Cancer gives you authoritative, practical answers to your questions about treatment options, post-treatment quality of life, sources of support, and much more. Written by two oncology nurses and a gastric surgeon, with extensive commentary from an esophageal cancer survivor, this book is an invaluable resource for anyone coping with the physical and emotional turmoil of this frightening disease. 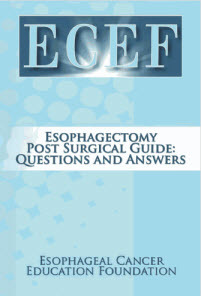 “Esophagectomy, Post Surgical Guide, Questions and Answers” was published by Authorhouse and authored by the Esophageal Cancer Education Foundation in conjunction with its Medical Advisory Committee. Various surgeons, medical oncologist and Professionals have responded to the most frequently asked questions and have provided their responses to those questions. This book can be purchased at any book store or through ECEF. Contact bart@fightec.org for more information. If you are a patient who has undergone an esophagectomy, this book provides a guide to the issues you may experience as you journey through the recovery process. It covers the critical 2-3 months just post surgery where most issues if they are going to be a factor will show themselves and it is good that a patient or caregiver can refer to this guide to see what the common answer is to the issue being experienced. As always it is suggested that you contact your surgeons office to tell them what you are experiencing to see if they agree with the answer to that issue that the guide provides. The Foundation has developed a series of pamphlets that can be displayed in a doctors office as reading material while patients are waiting to see their doctor. There are a series of 4 phmaplets that comprise this group. The Foundation has recently prepared a pamphlet that can be made availble to esophageal cancer patients who have just completed surgery and are beginning their post surgical recovery. We are prepared to send these pamphlets to Institutions and surgeons that do espohageal cancer surgeries so they can distribute this pamplet as part of the mateerial they provide to patients leaving the hopsital. This pamphlet covers a HOTLINE phone number to call when a patient or caregiver has a quality of life questions he has developed in his recovery. This is not a medical line as those questions should go directly to the patient’s doctor. In addition the pamphlet also indicates that support group conference calls are avialable to patients and caregivers who becomes a member of ECEF. You can click the sign up button at part of this web site to become a member at no cost.